This where we come in- you need a maid on a mission! Let A Castle Rock Superior Maid Service Clean Your House So You Have Time for What You Really Want To Do! Our house cleaning service is simply the maid company in Colorado! That’s because cleaning your house is not just our business- it’s our mission. We destroy gunk, eliminate grime, purify potties, eradicate dirt and remove blemishes, splotches, blotches and stains. Soap scum submits as soon as we park the car. Hardwood floors cry out for joy when they see us walk in. Blinds, mantles and shelves know that dust is no friend of ours. Okay...Maybe we got a little carried away there, but what we are trying to say is that we are really good at making your home or office look great. So you know that to-do list you’ve been hanging onto? Well go ahead and cross off “clean my house and make it look better than ever” because Castle Rock Superior Maid Service. We know you’re busy. And we know the last thing you want to try and fit into your hectic schedule is hours of cleaning your home. Remember, the one thing you can’t get more of is time. So let Castle Rock Superior Maid Service do what we do best and spend our time cleaning your house. Give us a call at 720-408-6526 and let's get started today. ​﻿The Superior Cleaning Service Challenges You to Take Back Your Time, Castle Rock! We challenge you to use our cleaning services for one month and see if you don’t find yourself enjoying things that you previously just didn’t have time for. Extra time with your kids, spouse, family, pets or maybe event the great Colorado outdoors. Whatever it is, we are sure there is something you would rather be doing than cleaning your home. While everyone is given only 24 hours each day, some people make the wise choice of buying more time. Cleaning your home isn’t an option, let us give you more time. Take our one month challenge! Pick up the phone and give us a call at 720-408-6526 and take back your time! We Guarantee Our Superior House Cleaning Services! Worried you might be too picky? Not happy unless everything is just right? We know exactly what you mean. We know it’s your home and you have high standards. That’s why we guarantee our home cleaning services. We promise that you will love the way your home looks after our maids clean. And if your house isn't cleaned to your standard, call us within 24 hours and our maids will return to provide a second cleaning. And as many cleanings thereafter until you're completely happy with the way your home looks. That’s right. We aren’t just talk. We fully guarantee that you will be pleased with the house cleaning services provided by our team. Superior Home Cleaning Services of Castle Rock- Let Us Show You The Difference! Some house cleaning companies send a different maid every visit. This makes it impossible to provide a consistent cleaning from week to week. We do our best to have the same maids clean your house each time. This way, your special requests are no longer special- now they're just part of how your home cleaning service operates. We know that a proper house cleaning means more than just some crumbless counter tops and a dust free mantle. What really matters is the satisfaction you feel when you come home to a clean house: the fresh smell of vacuumed carpets, the feel of bare feet on clean hardwood floor, the spotless surfaces of the bathroom and impressed guests that wonder how you keep up with it all. That's what we deliver and we do it by treating your house like our home. We're basically talking about the Golden Rule here; the quality of our house cleaning services is the same we would provide to our own home! We stick with straightforward pricing that doesn’t look for ways to charge you more. Instead, we’re too busy focusing on getting the job done. Everything will be agreed upon up front and you don't have to worry about surprise charges with us. Give us a call at 720-408-6526 or send us an email today for a quote. Frequently asked questions about the best house cleaning service in Castle Rock, CO! What Cites Do You Serve? Is it just Castle Rock? While we wish we could save everyone in the great state of Colorado from the burden of house cleaning but right now we provide services to Castle Pines, Lone Tree, Highlands Ranch, Elizabeth, Parker, Larkspur and of course Castle Rock! If your city isn't listed above, but you are still close by or part of Douglas County, give us a call at 720-408-6526 and see if we can serve you! How frequently will the maids provide house cleaning? Most clients prefer to do twice a month cleaning. This allows our clients to keep with up with the basic day to day maintenance while our maids keep up with the deeper cleaning. But our cleaning team can visit as frequently as you need! Give us a call at 720-408-6526 and let’s set up a cleaning plan for your lifestyle! Remember when we talked about saving time? Well why would any house cleaning service try to save you time cleaning but ask you to stock up on your own supplies? You have enough to worry about! We will provide all of our own earth friendly products- all you need to provide is your home. Let our maids worry about the rest! What if I want to supply my favorite product? Will you use it? Of course! If you have a favorite product that you would like us to use on a particular surface or room just let us know and leave it out. We would be more than happy to use your preferred product! Are your maids pet friendly? We are! We love pets and many of our maids have pets of their own. Because Castle Rock is so pet friendly many of our clients have pets as well. We know that keeping up with a large house and active pets is a full time job. In fact, it is our full time job! While many of us have dogs of our own, so far none of us have been successful in teaching them to to wipe their paws before they come in! So we are guessing your dog drags in a lot of dirt too. Not to mention the hair! Let us help you keep up with your active pets! 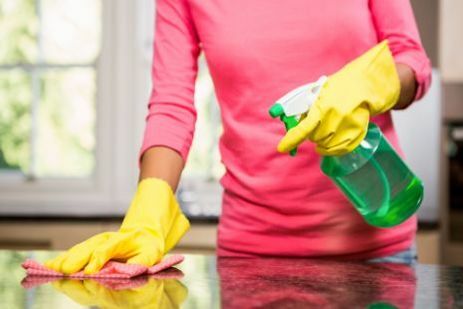 Does Castle Rock Superior Maid Service only do house cleaning? Not at all! We do far more than just clean houses! That's why often refer to ourselves as providing superior services and not just one service! We do a lot more than clean. We offer cleaning services for offices, condos, apartments, and any place of business in Castle Rock, CO. Because each business has different needs and different structures (unlike the bedroom/bathroom set up for house pricing) it’s best to call and we can discuss pricing based on your needs. Call us at 720-408-6526. For more about what we can do for you, check out our custom services page. Absolutely not! We know you’re busy so the last thing you probably want to do is hang around the house and watch us clean. You can give us a key to your home or provide the key at a convenient location around your house. All that being said, you are more than welcome to be present while our maids clean. ​Unanswered questions? Give us a call at 720-408-6526. We look forward to the opportunity to serve the wonderful people of Castle Rock Colorado! We love providing the best home cleaning services available in our great state. We know that not only is the quality of our cleaning service better, but our commitment to our clients is above and beyond any of our competition. A big part of that is simply because we have been there. We have struggled to get dinner, homework, and yes home cleaning done all while trying to spend time with family and loved ones. We give you the cleaning service we would want, if we were in your shoes. And we have been! We want to save you time and we see ourselves as much more than just a house cleaning service, we provide lifestyle support. We provide the means to allow you to live your life the way YOU want to. So give us a call today and let us show you how a proper home cleaning service can change your life.